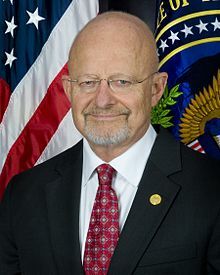 James Robert Clapper Jr. (born March 14, 1941) is a retired lieutenant general in the United States Air Force and is the former Director of National Intelligence. Clapper has held several key positions within the United States Intelligence Community. He served as director of the Defense Intelligence Agency (DIA) from 1992 until 1995. He was the first director of defense intelligence within the Office of the Director of National Intelligence and simultaneously the Under Secretary of Defense for Intelligence. He served as the director of the National Geospatial-Intelligence Agency (NGA) from September 2001 until June 2006. On June 5, 2010, President Barack Obama nominated Clapper to replace Dennis C. Blair as United States Director of National Intelligence. Clapper was unanimously confirmed by the Senate for the position on August 5, 2010. Following the June 2013 leak of documents detailing the NSA practice of collecting telephone metadata on millions of Americans' telephone calls, Clapper was accused of perjury for telling a congressional committee hearing that the NSA does not collect any type of data on millions of Americans earlier that year. One senator asked for his resignation, and a group of 26 senators complained about Clapper's responses under questioning. In November 2016, Clapper resigned as director of national intelligence, effective at the end of President Obama's term. In May 2017, he joined the Washington, D.C.–based think tank the Center for a New American Security (CNAS) as a Distinguished Senior Fellow for Intelligence and National Security. 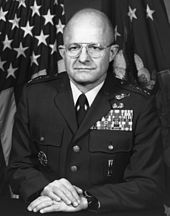 Clapper was born in Fort Wayne, Indiana, the son of Anne Elizabeth (née Wheatley) and First Lieutenant James Robert Clapper. His father worked in US Army signals intelligence during World War II, retiring as a colonel in 1972 then worked in security at George Mason University in the late 1970s and early 1980s. His maternal grandfather, James McNeal Wheatley, was an Episcopal minister. Clapper graduated from Nurnberg American High School in West Germany in 1959 where his father was stationed at the time. Clapper earned a bachelor of science degree in political science from the University of Maryland in 1963 and a master of science degree in political science from St. Mary's University, Texas in 1970. After a brief enlistment in the United States Marine Corps Reserve, where Clapper served as a rifleman and attended the junior course of Platoon Leader Training he transferred to the U.S. Air Force Reserve Officer Training Corps program. In 1963, he graduated as a distinguished military graduate from the University of Maryland and was commissioned as an Air Force second lieutenant. He served two tours of duty in Southeast Asia where he commanded a signals intelligence detachment based at a listening post in Thailand's Udon Thani Province, and flew 73 combat support missions in EC-47s, including some over Laos and Cambodia. Later, he commanded a signals intelligence (SIGINT) wing at Fort George G. Meade, Maryland, and the Air Force Technical Applications Center, Patrick Air Force Base, Florida. During the Persian Gulf War, Clapper served as Chief of Air Force Intelligence. Clapper became Director of the Defense Intelligence Agency in November 1991 under George H. W. Bush. While serving as DIA director, he oversaw the transformation of the National Military Intelligence Center into the National Military Joint Intelligence Center. He also launched an initiative to reorganize intelligence analysis by specialists in enemy weapons rather than specialists in countries and regions. The initiative failed because it created functional stovepipes which "reduced the coherence of the analytic effort", whereupon Clapper decided to restore the original organizational structure using strong regional elements. Clapper retired from active duty as a lieutenant general after thirty-two years of service in September 1995. In 1996, alongside General Wayne Downing, he was a member of the investigatory inquiry into the Khobar Towers bombing, which killed 20 people, including 19 American servicemen. He then spent six years in private industry, including two years as president of the Security Affairs Support Association, an organization of intelligence contractors. In August 2001, he was named as the director of the National Imagery and Mapping Agency (later renamed National Geospatial-Intelligence Agency) where he served until June 2006. From 2006 to 2007, Clapper worked for GeoEye (satellite company) and was an executive on the boards of three government contractors, two of which were doing business with the NGA while he served as director. In October 2006, he began working as chief operating officer for the British military intelligence company Detica, now DFI and U.S.–based subsidiary of BAE Systems. He also worked for SRA International and Booz Allen Hamilton. Clapper defended the private sector's role in intelligence-gathering in his 2010 confirmation hearings telling the committee, "I worked as a contractor for six years myself, so I think I have a good understanding of the contribution that they have made and will continue to make." For the 2006–2007 academic year, Clapper held the position of Georgetown University's Intelligence and National Security Alliance Distinguished Professor in the Practice of Intelligence. While teaching at Georgetown, he was officially nominated by President George W. Bush to be Under Secretary of Defense for Intelligence (USD(I)) on January 29, 2007, and confirmed by the United States Senate on April 11, 2007. He was the second person ever to hold this position, which oversees the Defense Intelligence Agency, the National Geospatial-Intelligence Agency, the National Security Agency (NSA), and the National Reconnaissance Office. He also worked closely with DNI John Michael McConnell. Defense Secretary Robert Gates suggested to President Obama that he nominate Clapper to replace Dennis C. Blair as Director of National Intelligence, but both Chairman Dianne Feinstein and Vice-Chairman Kit Bond of the U.S. Senate Intelligence Committee offered reservations regarding his appointment due to his military background and emphasis on defense-related issues. In an official statement in the White House Rose Garden on June 5, 2010, Obama announced his nomination of Clapper, saying he "possesses a quality that I value in all my advisers: a willingness to tell leaders what we need to know even if it's not what we want to hear." Lawmakers approved his nomination on August 5, 2010 in a unanimous vote after the Senate Intelligence Committee backed him with a 15–0 vote. During his testimony for the position, Clapper pledged to advance the DNI's authorities, exert tighter control over programming and budgeting, and provide oversight over the CIA's use of drones in Pakistan. In August 2010, Clapper announced a new position at the DNI called the Deputy Director of National Intelligence for Intelligence Integration, to integrate the former posts of deputy director for analysis and deputy director for collections into one position. Robert Cardillo, the deputy director of the Defense Intelligence Agency, was tapped to fill the new post. After an agreement between Clapper and Defense Secretary Robert Gates, his office assumed administrative control over the National Intelligence Program. Previously the NIP was itemized within the Defense Department budget to keep the line item and dollar amount from public view. In late October 2010, Clapper's office disclosed the top line budget as $53.1 billion, which was below the $75 billion figure circulated in 2010, in the belief the budget change would strengthen the DNI's authority. In February 2012, Clapper told the Senate that if Iran is attacked over its alleged nuclear weapons program, it could respond by closing the Strait of Hormuz to ships and launch missiles at regional U.S. forces and allies. Former Defense Intelligence Agency chief Lt. Gen. Ronald Burgess told senators that Iran is unlikely to initiate or intentionally provoke a conflict. Clapper said it's "technically feasible" that Tehran could produce a nuclear weapon in one or two years, if its leaders decide to build one, "but practically not likely." Both men said they did not believe Israel had decided to strike Iran back then. Clapper made "intelligence integration" across the Intelligence Community the primary mission of the ODNI. In 2012 the office announced an initiative to create a common information technology desktop for the entire Intelligence Community, moving away from unconnected agency networks to a common enterprise model. In late fiscal 2013 the shared IT infrastructure reached operating capability with plans to bring on all intelligence agencies over the next few years. On March 12, 2013, during a United States Senate Select Committee on Intelligence hearing, Senator Ron Wyden quoted NSA director Keith B. Alexander's keynote speech at the 2012 DEF CON. Alexander had stated that "Our job is foreign intelligence" and that "those who would want to weave the story that we have millions or hundreds of millions of dossiers on people, is absolutely false.... From my perspective, this is absolute nonsense." Wyden then asked Clapper, "Does the NSA collect any type of data at all on millions or hundreds of millions of Americans?" He responded, "No, sir." Wyden asked "It does not?" and Clapper said, "Not wittingly. There are cases where they could inadvertently, perhaps, collect, but not wittingly." When Edward Snowden was asked during a January 26, 2014, television interview in Moscow on what the decisive moment was or what caused him to whistle-blow, he replied: "Sort of the breaking point was seeing the director of national intelligence, James Clapper, directly lie under oath to Congress. ... Seeing that really meant for me there was no going back." On June 5, 2013, The Guardian published the first of the global surveillance documents leaked by Edward Snowden, including a top secret court order showing that the NSA had collected phone records from over 120 million Verizon subscribers. The following day, Clapper acknowledged that the NSA collects telephony metadata on millions of Americans' telephone calls. This metadata information included originating and terminating telephone number, telephone calling card number, International Mobile Station Equipment Identity (IMEI) number, time, and duration of phone calls, but did not include the name, address, or financial information of any subscriber. The rationale for this data collection, which was said to be permitted under Section 216 of the Patriot Act, was that if the NSA discovered a terrorist was calling into the U.S., and knew the number the terrorist was calling from, the NSA could look at the phone records to see what U.S. number he was calling to. If that indicated something worth investigating, obtaining caller identities and actually listening to the content of the calls would require a warrant from a U.S. court. On June 7 Clapper was interviewed by Andrea Mitchell on NBC. Clapper said that "I responded in what I thought was the most truthful, or least untruthful manner by saying no" when he testified. On June 11, U.S. Senator Ron Wyden (D-OR) accused Clapper of not giving a "straight answer," noting that Clapper's office had been provided with the question a day in advance of the hearing and was given the opportunity following Clapper's testimony to amend his response. On June 12, 2013, Representative Justin Amash became the first congressman to openly accuse Director Clapper of criminal perjury, calling for his resignation. In a series of tweets he stated: "It now appears clear that the director of national intelligence, James Clapper, lied under oath to Congress and the American people," and "Perjury is a serious crime ... [and] Clapper should resign immediately," U.S. Senator Rand Paul (R-KY) said "The director of national intelligence, in March, did directly lie to Congress, which is against the law." Paul later suggested that Clapper might deserve prison time for his testimony. On June 27, 2013, a group of 26 senators sent him a complaint letter opposing the use of a "body of secret law." On July 1, 2013, Clapper apologized, telling Senate Intelligence Committee that "my response was clearly erroneous—for which I apologize." On July 2, Clapper said that he had forgotten about the Patriot Act, which was later clarified that he forgot Section 215 of the act specifically, and therefore had given an "erroneous" answer. On July 2, 2013 journalist Glenn Greenwald accused the U.S. media of focusing on Edward Snowden instead of focusing on wrongdoing by Clapper and other U.S. officials. Jody Westby of Forbes argued that due to the revelations, the American public should ask Clapper to resign from office, arguing that “not only did Mr. Clapper give false testimony to Congress, even his June 6 statement was false. We now know—since the companies identified by the Washington Post have started fessing up—that lots more than telephony metadata has been collected and searched.” Fred Kaplan of Slate also advocated having Clapper fired, arguing "if President Obama really welcomes an open debate on this subject, James Clapper has disqualified himself from participation in it. He has to go." Andy Greenberg of Forbes said that NSA officials along with Clapper, in the years 2012 and 2013 “publicly denied–often with carefully hedged words–participating in the kind of snooping on Americans that has since become nearly undeniable.” John Dean, former White House Counsel for President Nixon, has claimed that it is unlikely Clapper would be charged with the three principal criminal statutes that address false statements to Congress: perjury, obstruction of Congress, and making false statements. David Sirota of Salon said that if the U.S. government fails to treat Clapper and Alexander in the same way as it did Roger Clemens, "the message from the government would be that lying to Congress about baseball is more of a felony than lying to Congress about Americans' Fourth Amendment rights" and that the “message would declare that when it comes to brazen law-breaking, as long as you are personally connected to the president, you get protection rather than the prosecution you deserve." Clapper and NSA director Keith B. Alexander (left) were both accused of lying under oath to Congress. On December 19, 2013, seven Republican members of the House Judiciary Committee called on Attorney General Eric Holder to investigate Clapper, stating "witnesses cannot be allowed to lie to Congress." In January 2014, Robert S. Litt, general counsel to the Office of the DNI, stated that Clapper did not lie to Congress, citing the context of the question and the fact that Clapper's staff had answered the question in writing the day before. In May 2015, Litt clarified that Clapper "had absolutely forgotten the existence of" Section 215 of the USA Patriot Act, and claimed he had been thinking of Section 702 of the Foreign Intelligence Surveillance Act when he gave the answer. In January 2014, six members of the House of Representatives wrote to President Obama urging him to dismiss Clapper for lying to Congress, stating his statement was "incompatible with the goal of restoring trust" in the intelligence community, but were rebuffed by the White House. Caitlin Hayden, the White House National Security Council spokesperson, said in an e-mailed statement that Obama has "full faith in Director Clapper's leadership of the intelligence community. The Director has provided an explanation for his answers to Senator Wyden and made clear that he did not intend to mislead the Congress." In March 2014, Clapper signed a directive that barred employees of the intelligence community from providing "intelligence-related information" to reporters without prior authorization, even to provide unclassified information, making a violation of the directive a "security violation." The order, which purportedly came as a result of congressional urging to crackdown on leaks, drew criticism from public watchdogs who claimed that the move would stifle inner-agency criticism and threaten whistleblowers. The following month he implemented a new pre-publication review policy for the ODNI's current and former employees that prohibits them from citing news reports based on leaks in their unofficial writings. In June 2013, the American Civil Liberties Union and the New York Civil Liberties Union filed a lawsuit against several defendants including Clapper challenging the intelligence community's bulk collection of metadata. The United States District Court for the Southern District of New York found in December 2013 that the collection did not violate the Fourth Amendment and dismissed the lawsuit. In June 2015, the United States Office of Personnel Management (OPM) announced that it had been the target of a data breach targeting the records of as many as 18 million people. The Washington Post has reported that the attack originated in China, citing unnamed government officials. Speaking at a forum in Washington, D.C., Clapper warned of the danger posed by a capable adversary such as the Chinese government and said, "You have to kind of salute the Chinese for what they did." In August 2015, fifty intelligence analysts working for United States Central Command (CENTCOM) complained to the Pentagon's Inspector General and the media, alleging that CENTCOM's senior leadership was altering or distorting intelligence reports on the Islamic State of Iraq and the Levant (ISIL) to paint a more optimistic picture of the ongoing war against ISIL forces in Iraq and Syria. They were subsequently joined by civilian and Defense Intelligence Agency analysts working for CENTCOM. Members of the groups began anonymously leaking details of the case to the press in late-August. In September 2015, The Guardian reported that according to an unknown former intelligence official, Clapper was in frequent contact with Brigadier General Steven Grove, who was said to be one of the subjects of the Inspector General's review. In February 2017, the Inspector General of the United States Department of Defense completed its investigation and cleared the senior leadership of CENTCOM, concluding that "allegations of intelligence being intentionally altered, delayed or suppressed by top CENTCOM officials from mid-2014 to mid-2015 were largely unsubstantiated." According to Rolling Stone magazine, Clapper was questioned about evidence of collusion between the Trump campaign and Russia during a March 2017 appearance on the television program Meet The Press. Chuck Todd asked: Were there improper contacts between the Trump campaign and Russian officials? Todd pressed him to elaborate. CHUCK TODD: If [evidence of collusion] existed, it would have been in this report? This is the former Director of National Intelligence telling all of us that as of 12:01 a.m. on January 20th, when he left government, the intelligence agencies had no evidence of collusion between Donald Trump’s campaign and the government of Vladimir Putin’s Russia. In his 2018 memoir, Clapper further addressed the issue. ...the President asserted that I had exonerated him of collusion, when, in fact, I'd made it very clear that the Intelligence Community simply could not corroborate allegations of collusion by the time we'd completed our report in January . ...The Russians and the [Trump] campaign seemed to employ strikingly parallel messaging in social media posts and public statements, effectively complementing each other to great effect, with no attempt to hide it...On a routine basis, whenever the campaign published an allegation that hurt [Hillary] Clinton, the Russians would repeat, amplify and embellish that claim; and when the Russians promulgated a conspiracy theory about her, the Trump campaign would repeat it at campaign rallies and on Twitter. Whether secretly coordinated or not, whether there was actual collusion or not, this parallelism constituted a putative team effort by the Russian government and the Trump campaign to undermine the truth and to cause much of the American public to question if facts were even knowable. And it didn't end with the election...in my mind, far more important that any specter of any collusion is the aggressive indifference of President Trump's administration to viewing Russia as a threat and its abject failure to do anything about this existential menace to our nation and our way of life." In November 2016, Clapper resigned, effective at the end of President Obama's term in January 2017. In June 2017 Clapper commenced an initial four-week term at the Australian National University (ANU) National Security College in Canberra that includes public lectures on key global and national security issues. Clapper was also expected to take part in the ANU Crawford Australian Leadership Forum, the nation's pre-eminent dialogue of academics, parliamentarians and business leaders. Clapper serves on the Advisory Board of the Committee to Investigate Russia, a nonpartisan, non-profit group formed with the intention of helping "Americans understand and recognize the scope and scale of Russia's continuing attacks on our democracy." In 2003, Clapper, then head of the National Geospatial-Intelligence Agency, attempted to explain the absence of weapons of mass destruction in Iraq by asserting that the weapons materials were "unquestionably" shipped out of Iraq to Syria and other countries just before the American invasion, a "personal assessment" that Clapper's own agency head at the time, David Burpee, "could not provide further evidence to support." In an interview on December 20, 2010, with Diane Sawyer of ABC News, Clapper indicated he was completely unaware that 12 alleged terrorists had been arrested in Great Britain earlier that day. The term 'Muslim Brotherhood' ... is an umbrella term for a variety of movements, in the case of Egypt, a very heterogeneous group, largely secular, which has eschewed violence and has decried Al Qaeda as a perversion of Islam.... They have pursued social ends, a betterment of the political order in Egypt, et cetera. ... In other countries, there are also chapters or franchises of the Muslim Brotherhood, but there is no overarching agenda, particularly in pursuit of violence, at least internationally. The Obama administration took the rare step later that day of correcting its own intelligence chief after the statement drew scrutiny among members of Congress. In March 2011, Clapper was heard at the United States Senate Committee on Armed Services commenting on the 2011 Libyan civil war that "over the longer term" Gaddafi "will prevail". This position was loudly questioned by the White House, when National Security Adviser Thomas E. Donilon qualified his statement as a "static and one-dimensional assessment" and argued that "the lost legitimacy [of Gaddafi] matters." During the same hearing he was also questioned when he neglected to list Iran and North Korea among the nuclear powers that might pose a threat to the United States. In March 2017, Clapper said on NBC's Meet the Press that the Office of the Director of National Intelligence had not obtained a FISA court order allowing the FBI to tap Trump Tower, rebutting Donald Trump's unsubstantiated claims that President Barack Obama personally ordered wiretapping of Trump Tower before the November election. Clapper stated "I will say that for the part of the national security apparatus that I oversaw as DNI, was there no such wiretap activity mounted against the president-elect at the time or as a candidate or against his campaign," but added that "I can't speak for other Title III authorized entities in the government or a state or local entity." Clapper also said that he saw no evidence of collusion between the Trump campaign and Russia. He stopped receiving briefings on January 20 and was "not aware of the counterintelligence investigation Director Comey first referred to during his testimony before the House Permanent Select Committee for Intelligence on the 20th of March". CNN stated that Clapper had "taken a major defense away from the White House." In a speech at Australia's National Press Club in June Clapper accused Trump of "ignorance or disrespect", called the firing of FBI director James Comey "inexcusable", and warned of an "internal assault on our institutions". In May 2017, Clapper was criticized by some media outlets for a xenophobic remark in an interview with Chuck Todd from Meet the Press. He told NBC's Meet the Press that Russians are "almost genetically driven" to act deviously. In an August 2017 interview, Clapper stated that U.S. President Donald Trump having access to the nuclear codes is "pretty damn scary" and he questioned his fitness to be in office. On October 26, 2018, the New York Times reported that an explosive device addressed to James Clapper was delivered to CNN offices in Manhattan. Federal authorities are investigating. In 1965, Clapper married Susan Ellen Terry, a former National Security Agency employee. They have a daughter, Jennifer, who is a principal of an elementary school in Fairfax County, Virginia. Clapper has a brother, Mike Clapper of Illinois, and a sister, Chris. He introduced them at his Senate confirmation hearings on July 20, 2010. Clapper also holds an honorary doctorate in strategic intelligence from the Joint Military Intelligence College, Washington, D.C., where he taught as an adjunct professor. Rosemary Award from the National Security Archive at George Washington University for the "worst open government performance of 2013." June 1971 – August 1973, military assistant to the director, National Security Agency, Fort George G. Meade, Md. August 1973 – August 1974, aide to the commander and intelligence staff officer, Headquarters Air Force Systems Command, Andrews Air Force Base, Md. August 1974 – September 1975, distinguished graduate, Armed Forces Staff College, Norfolk, Va.
August 1978 – June 1979, student, National War College, National Defense University, Fort Lesley J. McNair, Washington, D.C.
June 1979 – January 1980, Washington area representative for electronic security command, deputy commander, Fort George G. Meade, Md. February 1980 – April 1981, commander, 6940th Electronic Security Wing, Fort George G. Meade, Md. April 1981 – June 1984, director for intelligence plans and systems, Office of the Assistant Chief of Staff for Intelligence, Headquarters U.S. Air Force, Washington, D.C.
June 1984 – May 1985, commander, Air Force Technical Applications Center, Patrick Air Force Base, Fla.
July 1989 – March 1990, deputy chief of staff for intelligence, Headquarters Strategic Air Command, Offutt Air Force Base, Neb. April 1990 – November 1991, assistant chief of staff for intelligence, Headquarters U.S. Air Force, Washington, D.C.
November 1991 – 1995, director, Defense Intelligence Agency and General Defense Intelligence Program, Washington, D.C.
James R. Clapper with Trey Brown (2018). Facts and Fears: Hard Truths from a Life in Intelligence. New York: Viking. ISBN 978-0525558644. OCLC 1006804896. ^ Committee On Armed Services, United States. Congress. Senate (2008). Nominations before the Senate Armed Services Committee, first session, 110th United Congress. Senate Committee on Armed Services. Retrieved 2012-11-14 – via Books.google.ca. ^ Johnson, Loch K. (2015). "A Conversation with James R. Clapper, Jr., The Director Of National Intelligence in the United States". Intelligence and National Security. 30 (1): 1–25. doi:10.1080/02684527.2014.972613. ^ ""Under Secretary of Defense for Intelligence to be Dual-hatted as Director of Defense Intelligence," DNI News Release, May 24, 2007" (PDF). Archived from the original (PDF) on May 19, 2011. Retrieved 2011-03-13. ^ Urwitz, Neal (2017-05-09). "James R. Clapper, Jr. Joins CNAS as Distinguished Senior Fellow for Intelligence and National Security". Center for a New American Security. Retrieved 2018-02-22. ^ "Obituaries". Pqasb.pqarchiver.com. 1998-05-09. Retrieved 2012-11-14. ^ B and O Magazine. 2001-08-01. Retrieved 2012-11-14. ^ Garrett M. Graff (17 November 2016). "America's Top Spy Talks Snowden Leaks and Our Ominous Future". Wired. ^ Patterson, Michael Robert. "James R. Clapper, Colonel, United States Army". www.arlingtoncemetery.net. ^ "Rites For Father Wheatley, 1st St. George's Rector, Set". Pqasb.pqarchiver.com. 1969-01-30. Retrieved 2012-11-14. ^ a b United States. Congress. House. Permanent Select Committee on Intelligence (1 January 1996). Ic21: The Intelligence Community in the 21st Century: Hearings Before the Permanent Select Committee on Intelligence, House of Representatives, One Hundred Fourth Congress, First Session, May 22--December 19, 1995. U.S. Government Printing Office. p. 325. ISBN 978-0-16-052644-2. ^ Loch K. Johnson (9 February 2011). The Threat on the Horizon: An Inside Account of America's Search for Security after the Cold War. Oxford University Press. p. 77. ISBN 978-0-19-979297-9. ^ "Lieutenant General James R. Clapper Jr". af.mil. Retrieved August 17, 2017. ^ "A tradition of excellence … – Office of the DNI – Medium". Medium. 2016-08-03. Retrieved 2018-02-21. ^ Pam Dixon Executive Director (12 February 2016). Surveillance in America: An Encyclopedia of History, Politics, and the Law [2 volumes]: An Encyclopedia of History, Politics, and the Law. ABC-CLIO. pp. 71–. ISBN 978-1-4408-4055-5. ^ Michael A. Turner (8 October 2014). Historical Dictionary of United States Intelligence. Rowman & Littlefield Publishers. pp. 48–. ISBN 978-0-8108-7890-7. ^ Pam Dixon Executive Director (12 February 2016). Surveillance in America: An Encyclopedia of History, Politics, and the Law [2 volumes]: An Encyclopedia of History, Politics, and the Law. ABC-CLIO. pp. 72–. ISBN 978-1-4408-4055-5. ^ Robert R. Tomes (13 December 2006). US Defence Strategy from Vietnam to Operation Iraqi Freedom: Military Innovation and the New American War of War, 1973-2003. Routledge. pp. 84–. ISBN 978-1-135-98562-2. ^ Hosenball, Mark (August 5, 2010). "Clapper Is Confirmed as Intelligence Czar After a Round of Senate Dealmaking". Newsweek. Retrieved August 12, 2018. ^ "LTG James R. Clapper, Jr., USAF > Defense Intelligence Agency > Article View". Defense Intelligence Agency. 2013-10-31. Retrieved 2018-02-22. ^ a b Stein, Jeff (2010-04-13). "SpyTalk - Former DIA analysts rip Clapper's leadership". The Washington Post. Retrieved 2018-02-22. ^ a b "United States Air Force Biography". Af.mil. Archived from the original on 2013-08-02. Retrieved 2011-03-13. ^ Volker Franke (2005). Terrorism and Peacekeeping: New Security Challenges. Greenwood Publishing Group. pp. 103–. ISBN 978-0-275-97646-0. ^ "Clapper: Managing the Intelligence Enterprise". Foreign Policy In Focus. 2010-06-18. Retrieved 2018-02-22. ^ "Lt. Gen. James R. Clapper". NGA.mil. 2018-02-22. Retrieved 2018-02-22. ^ "Intelligence nominee's contractor ties draw scrutiny". LA Times. 2010-07-25. Retrieved 2014-02-15. ^ "Booz Allen Hamilton: Edward Snowden's US contracting firm". The Guardian. 2013-06-09. ^ "Professor in Practice of Intelligence Established". Explore.georgetown.edu. Retrieved 2011-03-13. ^ "DoD Announces Clapper as the New Undersecretary of Defense for Intelligence". Goliath.ecnext.com. 2007-04-16. Retrieved 2011-03-13. ^ "Defense intel chief dual-hatted to ODNI". UPI. 2007-05-24. Retrieved 2018-02-25. ^ a b Montopoli, Brian (2010-06-04). "James Clapper to be Tapped as New National Intelligence Director". CBS News. Retrieved 2011-03-13. ^ "Obama nominates Clapper to head spy agencies". MSNBC. June 5, 2010. Retrieved 2011-03-13. ^ The Washington Post, DNI nominee vows tighter reins on intel programs, washingtontimes.com, July 20, 2010. ^ "James Clapper Confirmed as Director of National Intelligence". Wall Street Journal. 2010-08-05. Retrieved August 6, 2010. ^ "Clapper's people". The Washington Post. 2010-08-23. ^ Got GEOINT?, Monday Morning News Kick Off: Robert Cardillo to Boost Collaboration for ODNI; Clapper Brings Sense of Humor to Job; SAIC Wins TASER Contract, gotgeoint.com, August 23, 2010. ^ "DNI Releases Budget Figure for 2010 National Intelligence Program". 2010-10-28. ^ "Control of intelligence budget will shift". The Washington Post. 2010-11-03. ^ One Spy to Rule Them All: Top Spook Launches Push for Real Power, wired.com, November 3, 2010. ^ Executive Gov, Clapper Seeks Authority over Intel Budget, executivegov.com, November 3, 2010. ^ "U.S. remains optimistic on Iran sanctions". CBS News. 2012-02-21. ^ "Intelligence Integration". U.S. Office of the Director of National Intelligence. Retrieved 2014-02-14. ^ Federal News Radio, Intelligence community cloud coming online in early 2013, federalnewsradio.com, October 10, 2012. ^ a b Greenberg, Andy. "Watch Top U.S. Intelligence Officials Repeatedly Deny NSA Spying On Americans Over The Last Year (Videos)." Forbes. June 6, 2013. Retrieved on June 11, 2013. "Eight months later, Senator Ron Wyden quoted[...]"
^ "Snowden Interview Transcript". NDR. Retrieved January 27, 2014. ^ "DNI Statement on Recent Unauthorized Disclosures of Classified Information". June 6, 2013. Archived from the original on June 7, 2013. Retrieved August 17, 2017. ^ "Verizon forced to hand over telephone data – full court ruling", The Guardian, June 6, 2013; retrieved June 12, 2013. ^ Clapper, James R,. (2018). Facts and Fears: Hard Truths From A Life In Intelligence (ebook ed.). New York: Viking. p. 226. ISBN 9780525558651. ^ "Transcript of Andrea Mitchell's Interview with Director of National Intelligence James Clapper". NBC News. 2013-06-09. Archived from the original on 2013-12-03. ^ Clapper, James R,. (2018). Facts and Fears: Hard Truths From A Life In Intelligence (ebook ed.). New York: Viking. pp. 226–227. ISBN 9780525558651. ^ Blake, Aaron (2013-06-11). "Sen. Wyden: Clapper didn't give 'straight answer' on NSA programs". The Washington Post. Retrieved 2015-11-20. ^ Muñoz, Carlos. "GOP's Amash: Clapper should resign", The Hill, June 12, 2013. ^ Ackerman, Spencer. "Rand Paul accuses James Clapper of lying to Congress over NSA suveillance", The Guardian. June 18, 2013. ^ Knowlton, Brian. "Senators differ sharply on penalty for Snowden", New York Times. January 6, 2014; retrieved August 17, 2017. ^ "Senators' letter to US director of national intelligence James Clapper", The Guardian, June 28, 2013; retrieved August 17, 2017. ^ Roberts, Dan. "Senators accuse government of using 'secret law' to collect Americans' data", The Guardian. June 28, 2013; retrieved August 17, 2017. ^ Roberts, Dan and Spencer Ackerman. "Clapper under pressure despite apology for 'erroneous' statements to Congress", The Guardian, July 1, 2013; retrieved July 2, 2013. ^ Ackermann, Spencer (July 2, 2013). "Clapper: I gave 'erroneous' answer because I forgot about Patriot Act". The Guardian. Retrieved February 13, 2014. ^ Glenn Greenwald. "James Clapper, EU play-acting, and political priorities." The Guardian. Wednesday July 3, 2013. Retrieved on July 3, 2013. ^ Westby, Jody (June 10, 2013). "Americans Must Call for Independent Counsel and Ouster of Clapper". Forbes. Archived from the original on August 21, 2013. ^ Kaplan, Fred. "Fire James Clapper." Slate. Tuesday June 11, 2013. Retrieved on June 14, 2013. ^ Dean, John (28 June 2013). "Will Director of National Intelligence James Clapper Be Prosecuted for Lying to Congress Regarding the NSA's Surveillance?". Justia. ^ Sirota, David (July 1, 2013). "James Clapper is still lying to America". Salon. Retrieved July 5, 2013. ^ "To reform the NSA, fire officials who lie", The Guardian, September 25, 2013. ^ "Put the NSA on trial", Salon.com, June 11, 2013. ^ Spencer Ackerman (2013-12-19). "Republicans demand consequences for 'willful lie' by intelligence chief". The Guardian. ^ Pengelly, Martin. "Clapper did not lie to Congress on NSA, says national intelligence counsel", The Guardian, January 4, 2014. ^ "Attorney: Spy chief had 'forgotten' about NSA program when he misled Congress". The Hill. 2015-05-08. ^ Hattem, Julian (2015-05-08). "Attorney: Spy chief had 'forgotten' about NSA program when he misled Congress". TheHill. Retrieved 2018-02-23. ^ "Lawmakers to Obama: Fire your intelligence chief for lying". MSNBC. February 27, 2014. Retrieved February 13, 2014. ^ Ackermann, Spencer (January 29, 2014). "James Clapper calls for Snowden and 'accomplices' to return NSA documents". The Guardian. Retrieved February 13, 2014. ^ Darrell Issa; Ted Poe; Paul Broun; Doug Collins; Walter Jones; Alan Grayson. "Congressman Darrell Issa letter to U.S. President Barack Obama" (PDF). Darrell Issa. Darrell Issa. Archived from the original (PDF) on 2014-02-21. ^ a b Fung, Brian (27 January 2014). "Darrell Issa: James Clapper lied to Congress about NSA and should be fired". The Washington Post. Retrieved 13 February 2014. ^ "US spy chief James Clapper prohibits employees from speaking with media, memo says". Foxnews. April 21, 2014. ^ Ackerman, Spencer (2014-04-21). "Clapper bans US intelligence employees from 'unauthorised' media contact". the Guardian. Retrieved 2018-02-23. ^ "U.S. intelligence chief bars unauthorized contacts with reporters on all intel-related matters". mcclatchydc. 2014-04-21. Retrieved 2018-02-23. ^ Dilianian, Ken (2014-04-22). "U.S. spy chief bans employees from talking to journalists". latimes.com. Retrieved 2018-02-23. ^ "Intelligence Policy Bans Citation of Leaked Material". The New York Times. May 9, 2014. ^ "ACLU sues over NSA surveillance program". The Washington Post. 2013-06-11. Retrieved 2018-02-22. ^ "ACLU v. Clapper – Challenge to NSA Mass Call-Tracking Program". American Civil Liberties Union. 2013-06-05. Retrieved 2018-02-22. ^ a b Levine, Mike (2015-06-25). "China Is 'Leading Suspect' in Massive Hack of US Government Networks". ABC News. Retrieved 2018-06-10. ^ Sanders, Sam (June 4, 2015). "Massive Data Breach Puts 4 Million Federal Employees' Records At Risk". NPR. ^ Luis, Martinez (2015-09-15). "Pentagon Confirms Probe Into 'Skewed' ISIS Intelligence". ABC News. Retrieved 2017-10-06. ^ Wong, Kristina (2015-09-10). "Report: Analysts claim US military altering intelligence on ISIS war". TheHill. Retrieved 2017-10-06. ^ Spencer Ackerman (September 10, 2015). "US spy chief's 'highly unusual' reported contact with military official raises concerns". The Guardian. ^ "Why the Russia Story Is a Minefield for Democrats and the Media". Rolling Stone. March 8, 2017. ^ Clapper, James R,. (2018). Facts and Fears: Hard Truths From A Life In Intelligence (ebook ed.). New York: Viking. p. 424. ISBN 9780525558651. ^ "Director of National Intelligence James Clapper has resigned". NBC News. November 17, 2016. ^ "James Clapper, the US intelligence chief, resigns". BBC News. November 17, 2016 – via bbc.co.uk. ^ Clapper to join Australian National University, anu.edu.au; accessed August 17, 2017. ^ "Committee to Investigate Russia: Advisory Board". Committee to Investigate Russia. Retrieved February 10, 2018. ^ "The Struggle for Iraq: Weapons Search: Iraqis Removed Arms Material, U.S. Aide Says". The New York Times. 2003-10-29. Retrieved 2011-03-13. ^ News, ABC. "Video: National Security Leaders Discuss Terror Threat". ^ Stein, Jeff (2010-12-21). "SpyTalk – Clapper flunks ABC's quiz on London terror case". The Washington Post. Retrieved 2011-03-13. ^ Gerstein, Josh (2011-02-10). "DNI Clapper retreats from 'secular' claim on Muslim Brotherhood". Politico. Retrieved 2011-03-13. ^ "Obama Administration Corrects Clapper's Claim That Muslim Brotherhood Is 'Secular'". Fox News. 2015-03-26. ^ "U.S. Escalates Pressure on Libya Amid Mixed Signals". The New York Times. 11 March 2011. ^ Kailani Koenig (March 5, 2017). "Former DNI James Clapper: 'I Can Deny' Wiretap of Trump Tower". NBC News. ^ Lauren Carroll, "Did Donald Trump invent claim that Barack Obama tapped his phone? ", PolitiFact (March 6, 2017). ^ "Full transcript: Sally Yates and James Clapper testify on Russian election interference". The Washington Post. May 8, 2017. ^ Kayyem, Juliette (May 8, 2017). "Clapper: Putin did it to demean Clinton and help elect Trump". CNN. ^ Butler, Josh (7 June 2017). "The Former U.S. Intelligence Chief Just Unleashed On Donald Trump". The Huffington Post. ^ "James Clapper Tells NBC's Chuck Todd That Russians Are 'Genetically Driven' to Co-opt". The Observer. 30 May 2017. ^ "James Clapper on Trump-Russia Ties: 'My Dashboard Warning Light Was Clearly On". NBC News. 28 May 2017. ^ "James Clapper Tells NBC's Chuck Todd That Russians Are 'Genetically Driven' to Co-opt". Yahoo! News. 30 May 2017. ^ Borger, Julian (August 23, 2017). "Ex-intelligence chief: Trump's access to nuclear codes is 'pretty damn scary'". The Guardian. London. Retrieved August 23, 2017. ^ Rashbaum, William K.; Feuer, Alan; Goldman, Adam (2018-10-26). "Outspoken Trump Supporter in Florida Charged in Attempted Bombing Spree". The New York Times. ^ "S. HRG. 111-857 – Nomination of Lieutenant General James Clapper, Jr., USAF, Ret., To be Director of National Intelligence". U.S. Government Printing Office. July 20, 2010. p. 7. Retrieved 2017-08-26. ^ "Carter Awards DoD's Highest Civilian Award to National Intel Director Clapper". DoD. ^ "King has honoured surveillance chiefs". ^ "Spy Chief James Clapper Wins Rosemary Award". ^ Al Kamen (March 24, 2014). "Spy chief James Clapper wins not-so-coveted Rosemary award". The Washington Post. Wikimedia Commons has media related to James R. Clapper.